A gift to myself, it has been too long since I've worn my own jewelry. A sweet picture of the kiddos from apple picking last weekend was the perfect inspiration. We have a contract on our house and the home inspection was last night. Today is "make or break" I suspect. A house that's 50+ years is bound to have a few blemishes. We have spent 7 years here fixing it up all the problems we knew about ...now I find myself worrying about the stuff I don't know about. Does that make sense or am I nuts?! 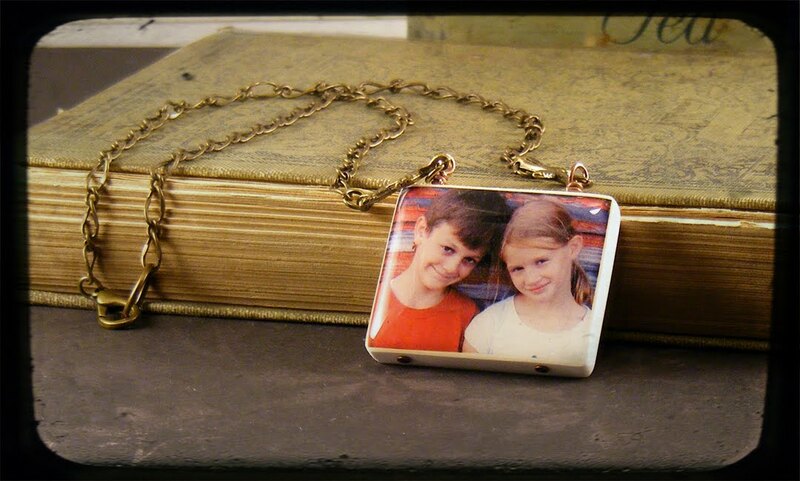 CUTE necklace of the kiddos. Great colors! Awww . . . what cutie patooties your kids are, Angie. I can't think of a better gift to create for oneself. I'm sure the whole inspection think is very nerve racking for sure! Hopefully you'll get a clean bill of approval and you can move onto the next step. Have a great weekend! Lovely pendant Angie and I will cross my fingers the inspection goes well. And if people are expecting a 50 year old home to be perfect they will be sadly disappointed but the charm of an older home makes up for it. 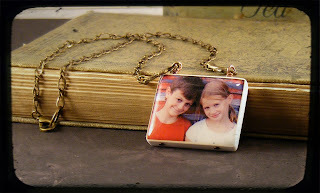 Perfect photo for that pendant...love their expressions! I hope all went well with the inspection. My youngest just settled on her first home ~ it can be a stressful time! I hope it all goes smoothly...have fun finding the pefect new home sweet home! !